SDI Video Input - 1 x 10 bit SD/HD switchable program input from switcher, including tally information. SDI Video Output - 4 x 10 bit SD/HD switchable camera outputs. 1 x 10 bit SD/HD switchable program loop thru output connects to another ATEM Studio Switcher. Talkback Audio - Aviation Headsets with 0.25" TRS headset connector and 0.206" TRS microphone connector. Front mounted balanced XLR microphone connector. Analog Audio - 1 x stereo RCA monitoring output. AES/EBU Audio Input - 1 x combined headphone input. 1 x combined microphone input. Combined inputs for connecting to other ATEM Studio Converters. AES/EBU Audio Output - 1 x combined headphone output. 1 x combined microphone output. Combined outputs for connecting to other ATEM Studio Converters. Balanced XLR Audio Output - 4 x camera stereo analog audio outputs. Optical Fiber Video Input - 4 x single mode SD/HD switchable camera inputs with LC connector. Optical Fiber Video Output - 4 x single mode SD/HD switchable camera outputs with LC connector. Optical Fiber Audio Input - 4 x single mode camera audio inputs with LC connector. Channels 1 & 2 are camera audio. Channels 15 & 16 are intercom audio. 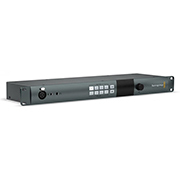 Optical Fiber Audio Output - 4 x single mode camera audio outputs with LC connector. Channels 1 & 2 are camera audio. Channels 15 & 16 are intercom audio. Computer Interface - 1 x mini-B type USB 2.0 connector for firmware updates. SDI Format Support: 525i59.94, 625i50, 720p50, 720p59.94, 720p60, 1080i50, 1080i59.94, 1080i60, 1080PsF23.98,1080PsF24, 1080PsF25, 1080PsF29.97, 1080PsF30, 1080p23.98, 1080p24, 1080p25, 1080p29.97,1080p30, 1080p50, 1080p59.94, 1080p60. SDI Compliance: SMPTE 259M, SMPTE 292M. Audio Sampling - Television standard sample rate of 48Khz, 24 bit A/D conversion. Color Space - REC 601, REC 709. Multiple Rate support - SDI switches between SD and HD. Software Included - Converter Utility for firmware update.